Monet designed this gracefully arched wooden bridgeâa prominent feature of the water gardenâto span a narrow part of his pond. The 18-foot structure was inspired by one of his Japanese woodblock prints. In 1911, following the devastation of major storms and flooding, he repaired and enlarged his water garden, adding the iron arbor. He planted the white Chinese wisteria on the lower handrails and the long lavender Japanese wisteria on the arbor; when in bloom, they create a canopy of lace. The reflections of the bridge are magnificent in the pond below. âThis is where Claude Monet lives, in this never-ending feast for the eyes. It is just the environment one would have imagined for this extraordinary poet of tender light and veiled shapes, for this man who has touched the intangible, expressed the inexpressible, and whose spell over our dreams is the dream that nature so mysteriously enfolds, the dream that so mysteriously permeates the divine light.â? Claude Monet created his finest work of art as a living study in light and color, an everchanging canvas that used his most beloved flowers as his paints. Each plant that grew in this magnificent painterâs paradise was thoughtfully placed, just as in an exquisite flower arrangement prepared for a painterâs still life. In turn, the gardens that Monet worked on for over forty years became the inspiration for his paintings for the second half of his life. The gardens at Giverny consist of the Clos Normand garden, featuring nearly three acres of flowers, with its Grande AllÃ©e (the flower tunnel with great arches of rambling roses above the broad walk carpeted with creeping, round-leafed nasturtiums), and the two-acre water lily garden with the arching green bridge woven with wisteria. We know these subjects well from Monetâs paintings â brilliant Impressionist depictions of natureâs moments of full bloom, glorious color, and light preserved on canvas through the hand of the great master. At the time Monet started painting, most painters began their practice with still lifes in the studio â bowls of fruit or bouquets of flowersâand, when they could afford it, with a model. Landscape painters often sketched various views from nature and then created the finished composition in their studios under controlled conditions. The plein air Impressionists painted out of doors â directly from nature â and dedicated themselves to capturing the impression of a fleeting moment. They carried their paints (made possible by the recent availability of oil paints in tubes), canvases, and easels through the meadows and orchards and along streams until they came upon an inspirational view. Finding a pleasing composition, perhaps a certain group of trees backlit with the rising sun, they set about painting it as quickly as possible in short, sure strokes of pure color. Monet expanded this concept by composing with nature as he designed, planted, and cultivated his gardens. Lovers of plants, gardens, design, architecture, fine art, Impressionism and Claude Monet, the master himself will be enthralled by this book written by an artist and gardener who has immersed herself in the glory of Giverny to such an extent that it has almost become a second home. Almost better than setting foot in Giverny in person, this book, with its lavish photography and interesting layover drawings, shows the garden that inspired the artist during the last forty years of his life. A professional gardener and artist, Elizabeth Murray helped to restore the Giverny gardens in the 1980s and has since enjoyed privileged access to the site, which she visits annually to capture Monetâs passion at its most radiant and riotous. In this redesigned, updated edition, Murray discusses the development and history of Monetâs Giverny estate and brings new insight to Monetâs approach to gardening and design. Emphasizing his keen understanding of color balance and his genius for maximizing the effects of light, Murray explores the color combinations and techniques with which Monet experimented in both painting and gardeningâeach pursuit informing the other. 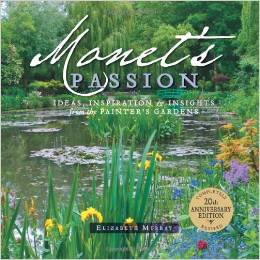 Murrayâs lush photographs chronicle the present-day gardens, and a section titled âBringing Giverny Homeâ? provides detailed Giverny-based garden plans that can be executed anywhere. Full-color illustrations of the gardens, a list of the plants originally used by Monet, and a plant cultivation section round out this immensely helpful guide to creating year-round beauty in oneâs own backyard. Elizabeth Murray received her bachelorâs degrees in fine art, environmental education, and botany from Sonoma State University. She is the author of numerous gardening and art books, including Painterly Photography: Awakening the Artist Within and Cultivating Sacred Space: Gardening for the Soul. Her photography is housed in several museum and private collections, including the de Young Museum of San Francisco and the New Orleans Museum of Art. Murray resides in Monterey, California, where she designs gardens as healing spaces and teaches creativity classes using photography, painting, and flowers.